Allison wanted something fun and simple for her birthday party. She wanted to invite people to her house rather than go out to a bar, but she isn't a huge cook, and reorganizing what she usually uses as a studio space back into a living room where her friends could hang out comfortably was going to be enough work in itself. So we came up with a tropical theme, threw together some simple eats (that didn't require plates and silverware), made a specialty cocktail from the Virgin Islands, and assembled some lighthearted decorations! This is Allison's studio/living room. She is the designer behind Zipper 8 Lighting, and as such the space is full of sample lights and materials. 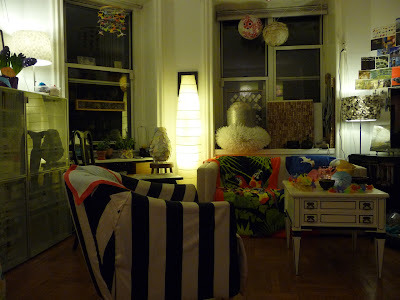 We decided to feature one of her light fixtures in our party decor because it went so well with the Tropical theme! 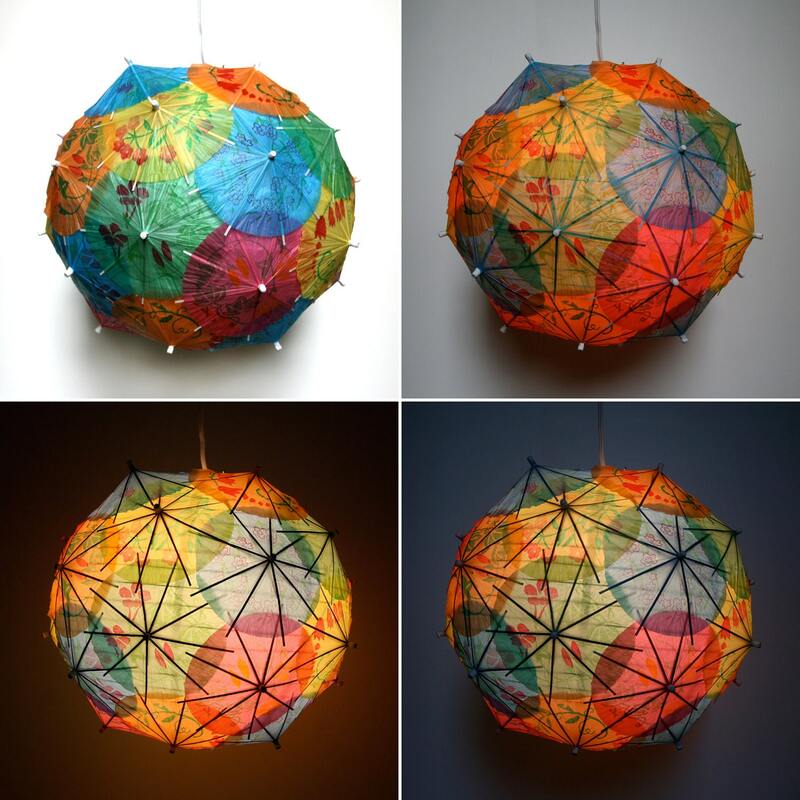 This is her Cocktail Umbrella Light, which you can purchase from Etsy. So we ran with the theme! We put cocktail umbrellas everywhere, and Allison bought some kitschy items from a party store to really help us glory in the tropical island sunshine. We also put together a playlist of some of our favorite beachy songs to evoke true "Island Time" (that is the pace of a Caribbean island, not Manhattan island). I just want to break this menu down for everyone who, like Allison, is concerned with the complexity of providing food at a party. This menu took two of us one hour to prepare and plate. Trader Joe's provided the nuts, chips, salsas, guacamole, shrimp and pre-marinated beef. 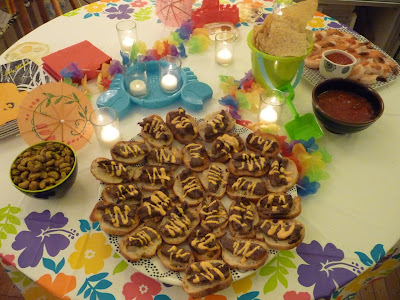 We had to cook the meat, cut the bread, mix mayo and sriracha sauce together, and assemble the toasts. Then we had to mix the drinks up, and plate everything. I made the cake. Now check out how festive and delicious it looks! For one hour's prep time, that ain't bad. Notice the chips in plastic sand buckets! 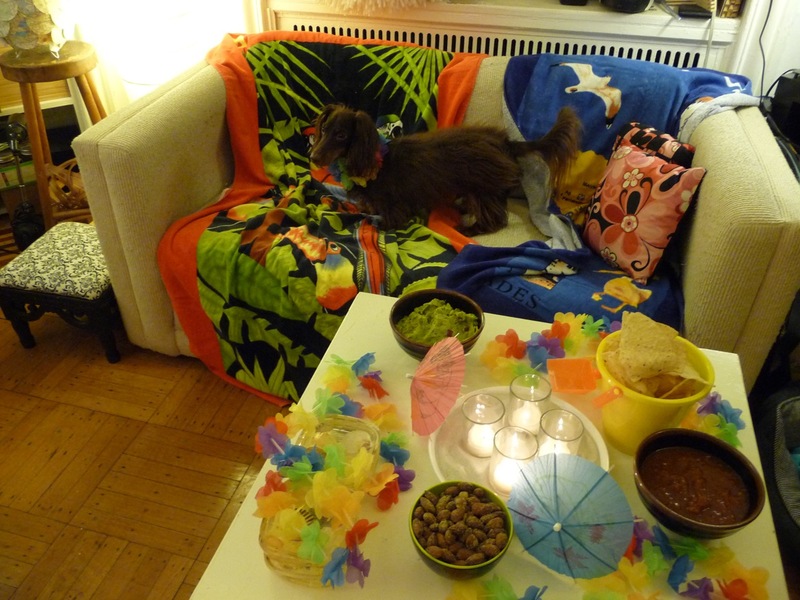 We gathered a bunch of beach towels and draped them over her furniture. You can see Allison's dog, Basel, lounging on "the beach" in the background. Amazingly, Allison had a container of sand she had held onto from a previous project. We poured this on a plate and nestled a bunch of candles in it. 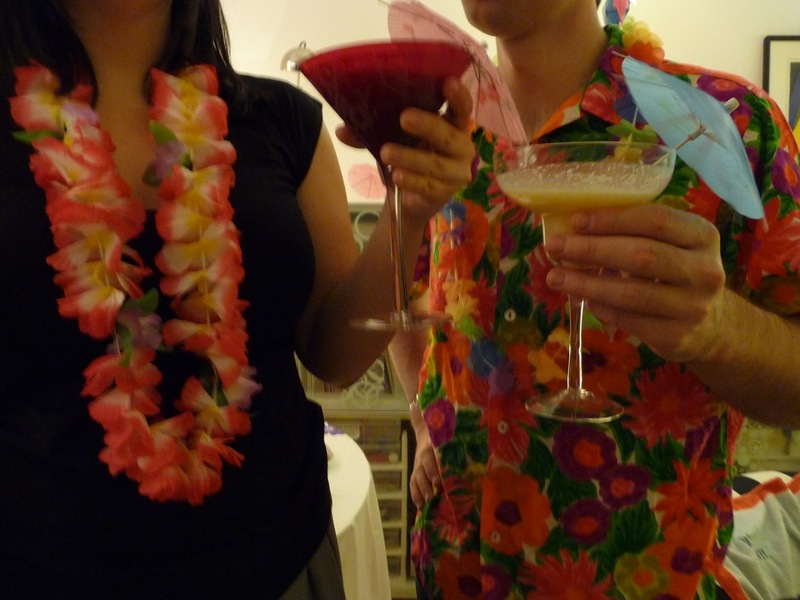 Some party-goers all dressed up for the occasion and drinking their Painkillers! 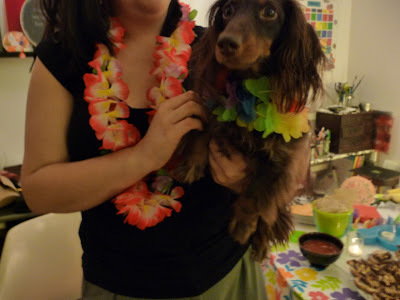 We hung leis around for guests who felt they needed some extra adornment. 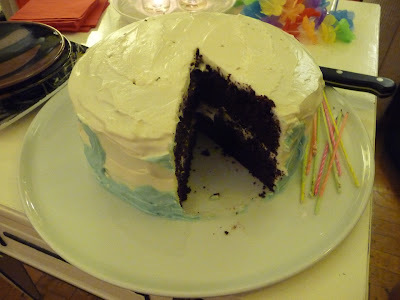 And here's the cake, with some lovely blue waves lapping at its edges, and my favorite tall and skinny birthday candles in neon colors. 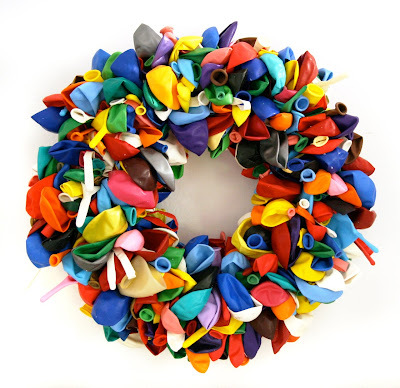 Allison made this brightly colored balloon wreath for her own birthday blog post this year. Go check it out at the 3 R's blog for a step by step tutorial on how to make your own, and other awesome ideas to Reduce, Reuse and Redecorate!